In a large oven-proof skillet or cast-iron skillet melt the coconut oil over medium high heat. Season the chicken with a little salt and pepper. Add the sliced onion and saute until translucent. About 3 minutes. Add the sliced apples and sage, saute for an additional 2-3 minutes just until soft, but a little crispy still. 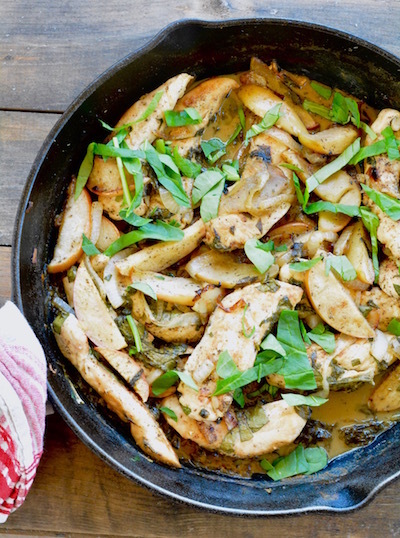 Transfer the onion and apple to a separate dish to hold while cooking the chicken. Add the chicken and cook on one side for 2 minutes and turn to the other side to cook for an additional 2 minutes. Add the apples and onions back in and the seasonings. Stir together and cook for a couple minutes. Make the "sauce" while the chicken cooks. Mix the apple cider and dijon together. Add the spinach to the chicken mixture and drizzle the sauce over top. Mix well. Place in oven and cook for approximately 20 minutes. For phase 2 you could add some chopped pecans on top. 1 1/2 lb Skinless Chicken Breast (cut into "tenders"
I found the apple cider vinegar. WAY too overpowering. After being in the oven the spinach comes out limp and unappetizing. Would not make this dish again. Hi Jackie, we recommend not using coconut oil in recipes that require high temperature cooking due to coconut oil having a low smoke point. This was REALLY great!! Full of flavor!! I’m just starting. I read the booklet PS1000 pure slim that came with the drops. It says not to use coconut oil to cook with, for phase one (page 26). I’m just starting. I read the booklet PS1000 pure slim that can with the drops. When is the sage added? OMG I feel like I’m cheating. This is amazing full of flavor and just plain good. Once again some prep involved but I have dinner for the week. I’m lucky that I don’t need to change it up every day and even it I was that type this is to good to pass up. I really am starting to understand how good food can be good for you and help get you to goal. I made this dish tonight and I have to say it was delicious and easy to make too! Full of flavor! I made this dish tonight and I have to say it was delicious, full of flavor. Thank you! I made this tonight and I loved it, full of flavor and very easy to make. I’m going to make this tonight. sounds delish!